The BL–5C battery episode with Nokia couple of years back had brought the fact of mobile explosion in the collective consciousness of the world. It had led people running helter-skelter to change their mobiles / batteries and also led to Nokia conducting a large scale recall of these batteries. This also caused a lot of damage to their reputation. But over a period of time many incidents of mobile phone explosions have been reported from various places. But off late, something weird or so it is said is going on in state of Assam. More than 30 cases of mobile phone explosions (Nokia, Samsung, Sony Ericsson) have been reported across the state and an equal number of people have been taken to hospitals. The symptoms of the victims range from splitting headaches, nausea to even some become unconscious. Now all of you must be wondering that this happens at a lot of places and there’s nothing great in it to be looked into. But when you hear that the CM, Tarun Gogoi has ordered a probe into the entire matter, you really wonder that the situation could be serious. 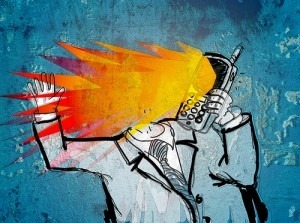 The exact sequence of events goes like this – People get calls from unknown numbers which flash in red and When they pick up the call, the phone explodes!!! Panic has gripped everyone in Assam. From switching off their phones to sending messages to people as to not to pick up calls from certain numbers, everyone has been scared out of their wits end wondering what to do. I personally have seen a lot of mails warning me not to pick up calls from unknown numbers. From what I think I know, GSM signals by themselves wouldn’t be able to cause an explosion. And therefore picking up a call shouldn’t be a harmless exercise. Though I strongly believe that this would be a hoax, a tiny part of me makes me think that this could be one of those phenomena which can never be explained. And it would always have multiple explanations by multiple people. what do you think? Is there any rational explanation to this or is it just another hoax? Now, Charge Your Smartphone with KFC’s Watt a Box Combo Meal! Oppo, the Apple of China to Enter India With Find 5! This particular hoax has originated from Gujarat a few months ago. There was quite a buzz in news in August, and now nothing is there. Just the hoax has transferred to Orissa. Hey Aditi, even I think its a hoax. i think we as a nation thrive on hoaxes :P.